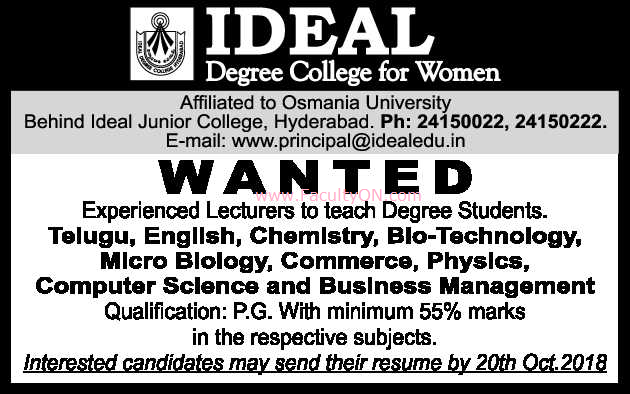 Ideal Degree College for Women, Hyderabad has advertised in the THE HINDU newspaper for recruitment of Lecturers jobs vacancies. Interested and eligible job aspirants are requested to apply on or before 20th October 2018. Check out further more details below. About College: Ideal Degree College For Women was established and is run by a group of highly qualified academicians with the objective of imparting quality educations and excellent standards of discipline. Ideal Degree College has grown in leaps and bounds from a college with 55 students on its rolls in 2003 to a mammoth institution, catering to the educational and career needs of over 1800 students now, largely owing to the commitment and meticulous planning of the management, ably supported by a very dedicated and talented staff of lecturers.